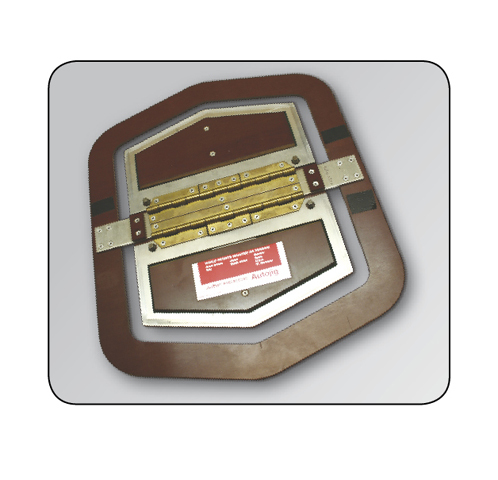 The autojig machine 84-55 incorporates a number of important innovations and is offered in M or U version depending on the stitching template size. While the 84-55M autojig machine accommodates stitching templates up to 60 cm in length the 84-55U autojig machine is designed for handling of very large stitching temples up to 140-150 cm in length. Patented intermittent/ continuous dual drive system enables the stitching templates to be turned at acute corners and also to be driven in “reverse” for back tacking the seam ends if required. The autojig machine is equipped with microprocessor that controls all of the sewing functions. 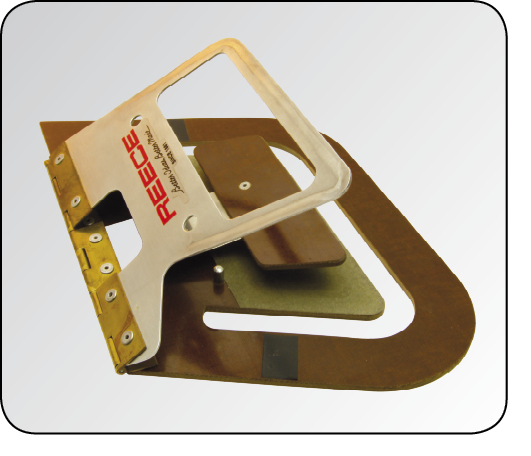 This autojig machine is widely used for the run stitching of cuffs, pockets, pointed and rounded collars, jacket foreparts tec. 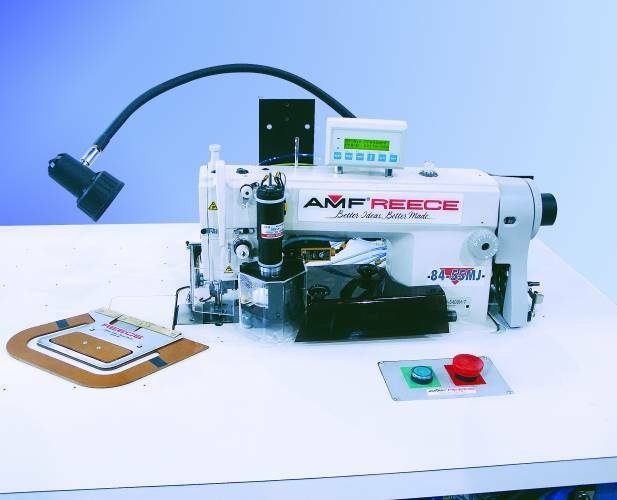 The standard AMF Reece Autojig intermittent drive mechanism advances the stitching template only when the needle is in the “up” position, for optimum stitch quality, garment appearance and needle life. The 84-55 models for the first time combine this feature with selectable continuous drive, to move the template at unstitched sections of the profile or turning the template at acute corners or for “fly” fronts for example. Patented intermittent/continuous dual drive system also enables stitching templates to be driven in “reverse”; for back tacking the seam ends if required. Additionally, on completion of the sewing cycle, large templates can be driven automatically at high speed back to the start position, to reduce the time needed for exchanging templates. This machine incorporates DLM 5400 Juki sewing head ensuring high quality stitching. This facility automatically initiates the sewing cycle as soon as the template is moved to the start position. Large Capacity Hook & Base minimizes stoppages for bobbin changing. Increased Sewing Speed, from 2600 spm to 3600 spm, ensures that even the fastest operator never needs to wait for the machine to complete its sewing cycle. Therefore the productivity is also increased up to 30%. The M model is very flexible and can be used to sew most components from a pocket flap to a pointed collar. The maximum sewing length is 60 cm (24”). Both single or double templates can be used on this machine. Typical applications are - yoke or gun patch, pointed/rounded collar, attach collar band, tabs, epaulette, pocket flap, patch pockets, waistband extension, jacket collar. 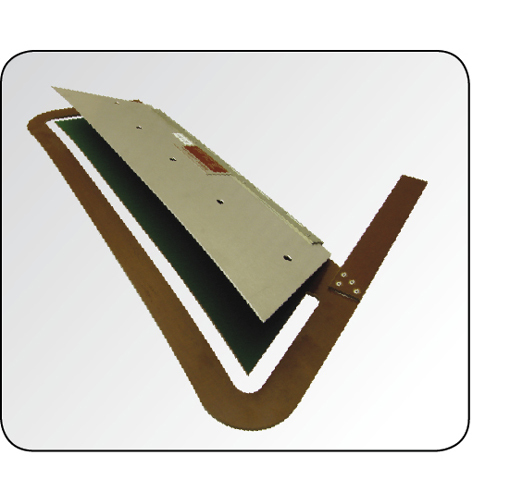 The U machine model is upgraded version of M model with further unique features to facilitate the handling of very large stitcging templates up to 140-150 cm in length. Both single or double templates can be used on this machine. The models is intended primarily for major applications such as attaching the facing to the forepart of jackets and top coats which is one of the most critical operations in the manufacture of tailored outwear. Typical applications are: jacket forepart, raincoat forepart, vest front, pocket flap, pointed/rounded collar, cuff, tabs, epaulettes etc. air flotation system - to support large stitching templates on a cushion of air. This system can be turned off when small components are being sewn. template alignment feature - to preservent the correct orientation of large templates during stitching to provide a more smoothly trimmed cloth edge. 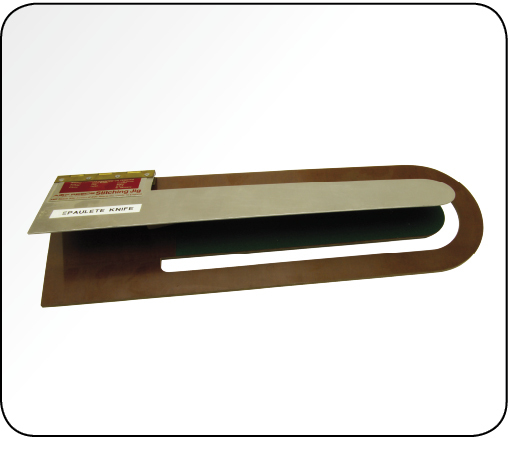 large worktable extensions and ergonomic template loading station - to help to accommodate the large templates such as jacket and raincoat forepart.